ISLAMABAD: UAE construction company Emaar on Friday offered to invest in the Pakistani government’s five-million housing scheme to provide housing for low and middle-income families. 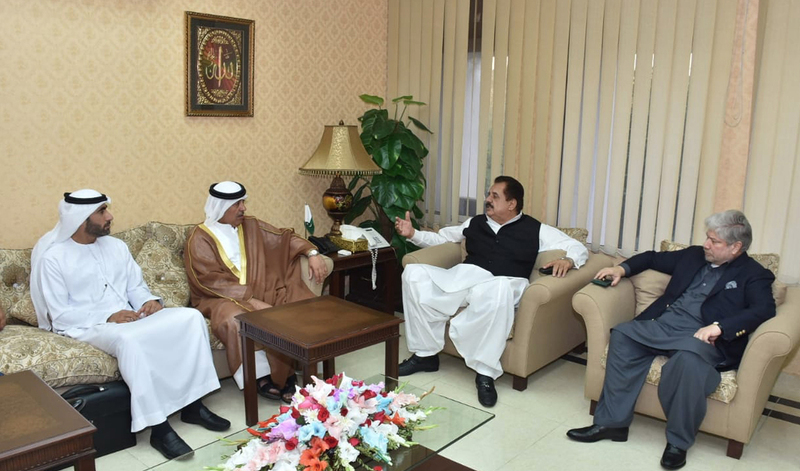 A high-level Emirati delegation met Federal Minister for Housing and Works Tariq Bashir Cheema at his office to discuss the options. The UAE delegation visited Pakistan under the auspices of Abu Dhabi’s Crown Prince Mohammed bin Zayed to discuss mutually beneficial projects the countries could work on together. The government’s plans to address the country’s housing shortage have received a positive response from both the public and private investors, though many remain skeptical about the likelihood of success. “It is a great initiative. The announcement of this project shows this government cares for the poor,” said Ajmal Chan as he stood in a long queue in Islamabad’s Blue Area to submit his application for a house. He works in a steel mill in the industrial area of the capital and earns the equivalent of about $400 a month. Nusrat Bibi, who was waiting outside a National Database and Registration Authority office in Islamabad to submit her application said the government should expedite the registration process. “Apna ghar (owning a home) is a dream and hopefully it’ll come true through this project,” she added. On October 10, Khan announced the project to build five million residential units for low and middle-income groups. The government will accept applications for the homes for the next 60 days. The project is initially being launched in seven cities — Islamabad, Sukkur, Gilgit, Muzaffarabad, Quetta, Swat and Faisalabad — and in time will be expanded to other areas. Tashfeen Safdar, parliamentary secretary at the Ministry of Housing and Works, said the government has completed the initial preparations for the project and now a database will be established containing information from the applicants. Safdar added that the government will provide the land, while private investors and banks will finance rest of the plan. “The project will bring an economic revolution in the country,” she said, adding that the government plans to increase the country’s mortgage ratio from current 0.25 percent to at least 15 percent of the population in the next five years. Of the five-million low-income residential units, 40 percent will be built in rural areas, 40 percent in urban areas and the 20 percent in slums to provide shelter for the homeless, she explained. The housing shortage in Pakistan is estimated to be up to 10 million units, and the deficit continues to grow, particularly in urban areas, according to a recent World Bank report. It found that estimates of annual new demand for housing ranged from 400,000 to 700,000 units, but that only between 100,000 and 350,000 units were being built each year. Private builders and developers have been upbeat about the prospect of investing in the project, but are still awaiting full information from the government about the numerous legal and financial issues. “This appears to be an innovative scheme but the government still needs to clarify a lot of things to local and foreign investors,” said Arif Yousuf Jeewa, former chairman of the Association of Builders and Developers of Pakistan.